Most owners will choose of the first two options. But maybe, you’re clear-headed and know that your current pitching staff just doesn’t have the stuff to improve. You don’t want to risk your season in the hands of a prospect. Maybe streaming is not very enticing either. You want stability, so you start thinking of a trade. But what kind of trade do you need? Most owners may have a vague idea they’d like to improve pitching, and will shop around for great pitchers on other teams who can be helpful in attaining the goal of improving pitching. But then again, why pay for Ubaldo Jimenez and Josh Johnson if you only need Ted Lilly and Hiroki Kuroda? Sure, you may accomplish your goal of upgrading pitching, but by sacrificing too much to plug the leak on one end, you may cause the dam to burst on the other. Frankly, if you only need to diminish your team ERA by 0.05, you’re better off hoping the gods of fantasy baseball luck cooperate. Eight runs over 850 innings is simply within the margin of error of any projection. That said, for the sake of fun, let’s take a look at some swaps that would yield 8 runs saved. To do this, we’re going to use ZIPS rest-of-season projections. Eight runs is not a lot. It can easily (and best) be done by upgrading a closer. For example, going from Matt Capps to Brian Wilson or from Kevin Gregg to Heath Bell. Your trading partner may shrug off this exchange because he’s not giving up a ton of saves, but there’s an ERA benefit in making such a swap. If you’re doing well in saves you might also consider trading your back-end closer for an upgrade in hitting, and replacing one of your closers with a top middle reliever or set-up man. For example, going from Arizona’s shaky new closer Aaron Heilman to Luke Gregerson would do the job. If you want to diminish your ERA by 0.1 the rest of the way via trade, you can get creative with your bullpen by trading for two closers, or punting shaky closers and saves and going with middle relievers. More likely, you’ll be looking at the starting pitching market. What kind of starters need to be exchanged to yield savings of 16 runs? You’ll probably need to upgrade two or three slots, meaning exchanging a #3 or #4 for a #1, like Ricky Nolasco for Cliff Lee or James Shields for Tim Lincecum. Buying those two pitchers would probably be expensive, though. So a better strategy might be looking to drop your #5 and acquire a #2 or #3: Getting rid of someone like Wade LeBlanc/Mike Pelfrey/Barry Zito/Fausto Carmona and trading for someone like Roy Oswalt/Hiroki Kuroda/Clayton Kershaw/Ted Lilly should be good enough. We’re now at the point where teams need to be looking at drastic upgrades. To give you an idea, going from Paul Maholm to Cliff Lee saves just 19 expected runs. Going from Kyle Kendrick to Tommy Hanson saves 22 expected runs. In other words, to diminish your ERA by .15, you probably need to trade for an ace and hope the acquired pitcher can get a little bit lucky the rest of the season. To diminish your ERA by 0.2 via trade, you’re probably looking at multiple player swaps. If you’re looking at the standings and see a gap this large, you may want to consider combining some of the strategies outlined above. For instance, when you ask for an ace pitcher in a trade, you may also try to press your trading partner to include a closer swap too. So for example, a trade might look something like this: Alex Rios and Matt Capps for Cliff Lee and Joakim Soria. At a certain point, catching up in ERA is going to either be too difficult or too expensive. At that point, it might be a better strategy to look the other way by deciding to sacrifice some ground in ERA for greater potential gains in other categories. We’ll have more on that in a future post. One myth that is constantly perpetuated in the echo chamber of fantasy baseball analysis is that relievers are one-category players. Quite a number of very smart analysts have been telling competitors for years that relievers are good for saves and hardly anything else. This analysis may be true for Head-to-Head leagues with short scoring periods and Roto leagues with high innings maximums — where ability to dominate often depends more on the bulk rather than the quality of innings pitched. But in the vast majority of rotisserie leagues, the notion that relievers don’t contribute value beyond saves just doesn’t hold any water. In fact, people may be surprised to learn that a great reliever can contribute just as much value in ERA and WHIP as a good starter. Let’s take an example from the 2009 season. Pretend two competing fantasy teams each finished the year with 1200 innings. The pitchers on Team A let up 500 earned runs. The pitchers on Team B let up 520 earned runs. Doing simple arithmetic tells us that Team A wound up with an ERA of 3.75 whereas Team B wound up with an ERA of 3.9. In other words, Team A was superior in ERA based upon those 20 earned runs saved by his pitching squad. Now, here’s what most people miss: Great relievers have the ability to save just as many earned runs as good starters. Let’s take a comparison of two closers last year — Jonathan Papelbon and Fernando Rodney. 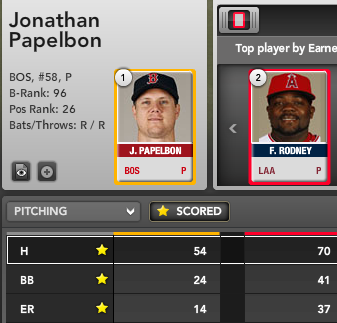 As you’ll see above, Papelbon saved 23 runs and 33 H+BB over Rodney. 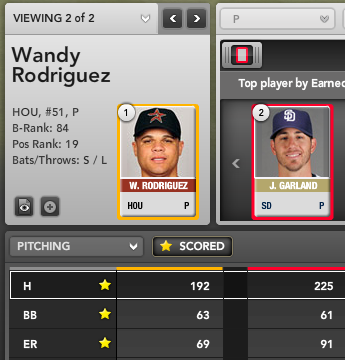 Now let’s compare two starting pitchers from last season: Wandy Rodriguez and his spectacular 3.02 ERA versus Jon Garland and his decent-but-not-great 4.01 ERA. Both pitchers ended the season with about 205 innings. How many runs, hits, and walks did Way-Rod save over Garland? The answer is just 22 earned runs and 31 H+BB. This means that having the combination of Jon Garland + Jonathan Papelbon instead of Wandy Rodriguez + Fernando Rodney was very slightly more beneficial to a team’s ERA and WHIP in 2009. Stated another way, a team that decided to draft Papelbon very high in drafts last year instead of waiting to fill the closer spot with someone of Rodney’s caliber managed to boost his team’s ERA and WHIP about as much as having one of baseball’s top starters from the previous season instead of Garland. I know this conclusion may be hard for some people to stomach. Yes, a starter who puts up a 3.75 ERA is more valuable than a reliever who puts up a 3.75 ERA. But what about a reliever like Jonathan Broxton who is projected at 2.76? How do we weight his contribution? If we figure that teams will roughly wind up with the same amount of innings pitched in total, the real question becomes how many runs will be saved by Broxton against inferior relievers. 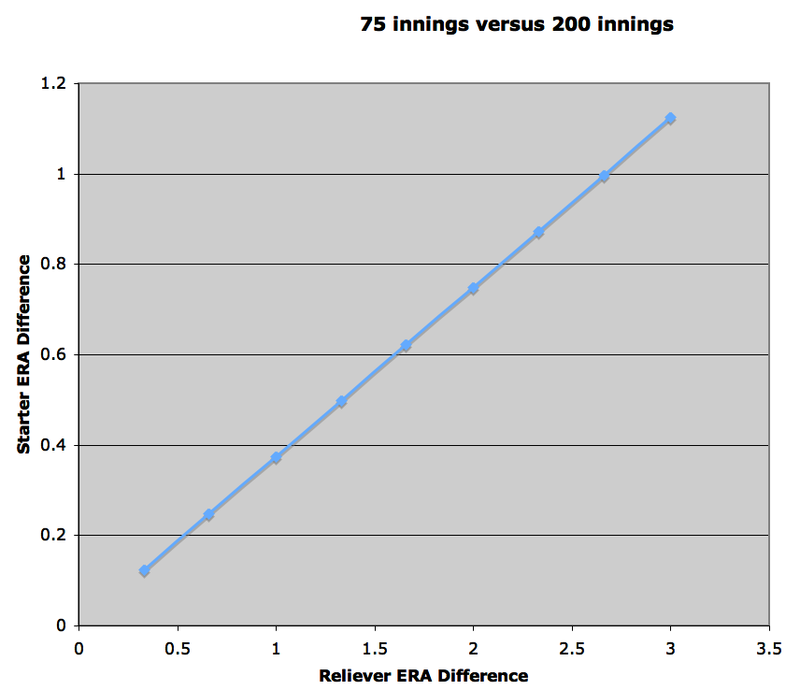 By our math, an ERA difference of 1.00 for a reliever in 75 innings translates to 8.3 saved earned runs over the course of a season. That’s about the difference we see when looking at Bloomberg Sports’ projections on Broxton versus Leo Nunez. Eight runs might not sound like a lot, but it’s the equivalent of an ERA difference of .36 for two pitchers who are both expected to reach 200 innings. The difference between Broxton and Nunez is the difference in ERA value from a 3.75 starter (Justin Verlander‘s 2010 Bloomberg Sports projection) and a 4.12 starter (like Aaron Cook‘s ’10 forecast). Of course, there are other factors such as variability and scarcity to consider too. In Part 2 of this study, we’ll examine those variable, and also discuss the implications on a fantasy team’s strategy when it comes to drafting relievers. Does it make sense to draft a stud closer high? If relievers bring ERA and WHIP value to the table, does it make more sense to draft a great middle reliever over a shaky closer? Stay tuned. For more information on Jonathan Papelbon, Jonathan Broxton, and other top relievers, check out Bloomberg Sports’ fantasy kit.